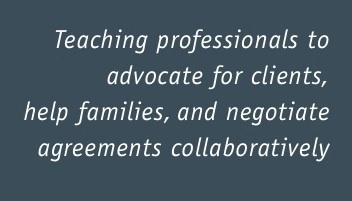 Teaching professionals to advocate for clients, help families, and negotiate agreements collaboratively. If you are an attorney, mental health professional, or financial planner wanting to expand your services to include Collaborative Practice, please join us, TACP, at our next Interdisciplinary Collaborative Practice Basic Training on May 2nd and 3rd, 2014 in St. Charles, Illinois, about 40 miles west of Chicago. Using a combination of lectures and hands-on role playing exercises, we will guide you through the steps of a Collaborative case, help you build critical skills in interest-based dispute resolution techniques, and provide you with the opportunity to practice these techniques and receive feedback in a learning environment. Our goal is to provide you with the foundation necessary to develop a practice that includes helping people resolve their disputes using this dynamic model. We are pleased to announce that Judge Michele Lowrance (Ret. ), author of The Good Karma Divorce and a long-time advocate of non-adversarial approaches to divorce, will join us for a reception on Friday evening, May 2nd. To register for the training, please visit TACP.eventzilla.net or click on “Register” button. Tap into our experiences and build a network of Collaborative Professionals in your community. This entry was posted in TACP Trainings and tagged Ann Cerney, Collaborative Practice, Jack Long, Sandra Crawford, TACP, Theresa Kulat, Training on February 28, 2014 by collabtrainers. To schedule Interdisciplinary Collaborative Basic Training in your area or to learn more about TACP, please contact us at TACP1@comcast.net or call 630-960-4656.